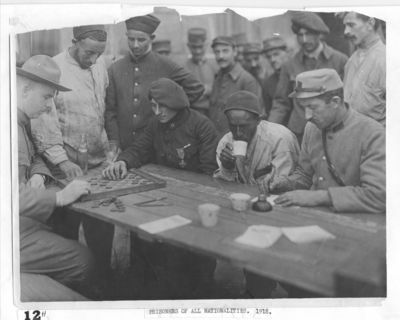 An American and a French POW play a game of checkers, while another prisoner drinks tea and a French prisoner writes a letter. Arab, French, and British prisoners watch the competition as spectators. The wide range of nationalities in the photograph depicts the world war the Central Powers faced in Europe.